Two short videos of transition drills from successful Division 1 Coaches. The first is a 1 on 1 drill to work with players on developing an aggressive downhill mentality with former Buffalo (now at Alabama) Men’s Coach Nate Oats. 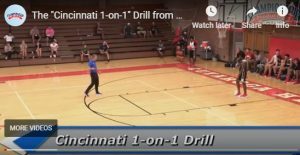 In addition to a demonstration of the drill, Coach Oats provides his 5 defensive non-negotiables. The second video is Arkansas women’s coach Mike Neighbors with a 5 on 0 transition drill.